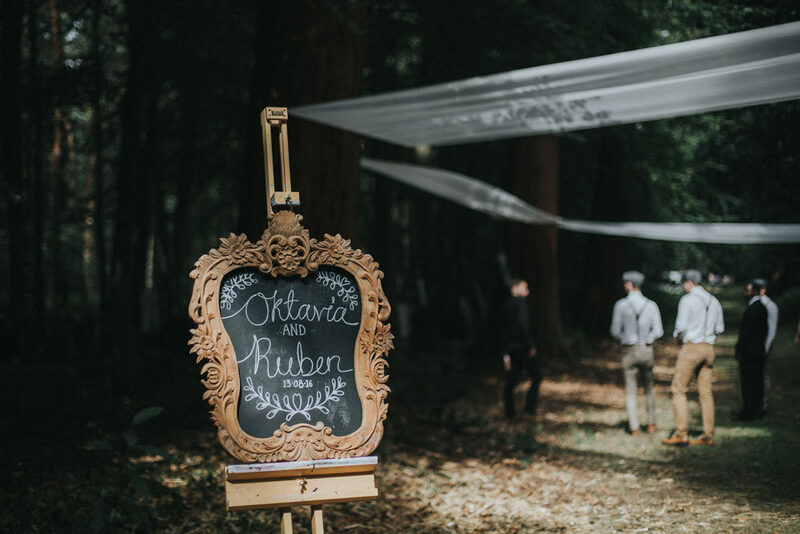 Octavia the Bride: Our ceremony was held in a forest at Thoresby Courtyard, Nottinghamshire. 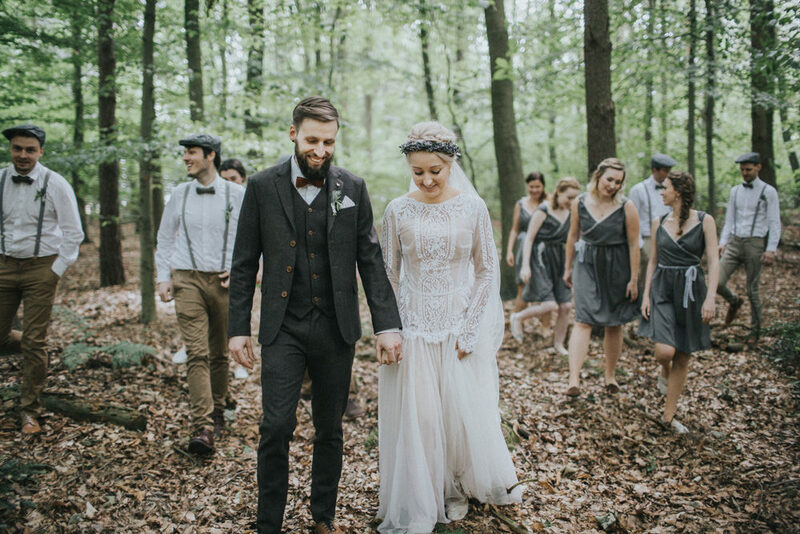 Growing up in Germany I would spend a lot of time in the woods, we both love forests and knew we wanted a woodland ceremony. We wanted our ceremony setting to be outside, unusual and romantic. We looked around a lot of options, Thoresby Courtyard was available and happy to help us bring our idea to life. Teresa the wedding coordinator at Thoresby Courtyard was so helpful in creating our vision and helping us in providing the hay bails, which completed the look. Our reception venue was held at the Tudor Barn at Warsop, I found this venue when looking at another wedding on our photographer’s website and loved it, our photographer Grace put us in touch with the bride from this other wedding and she was really helpful in giving us more info about the barn. 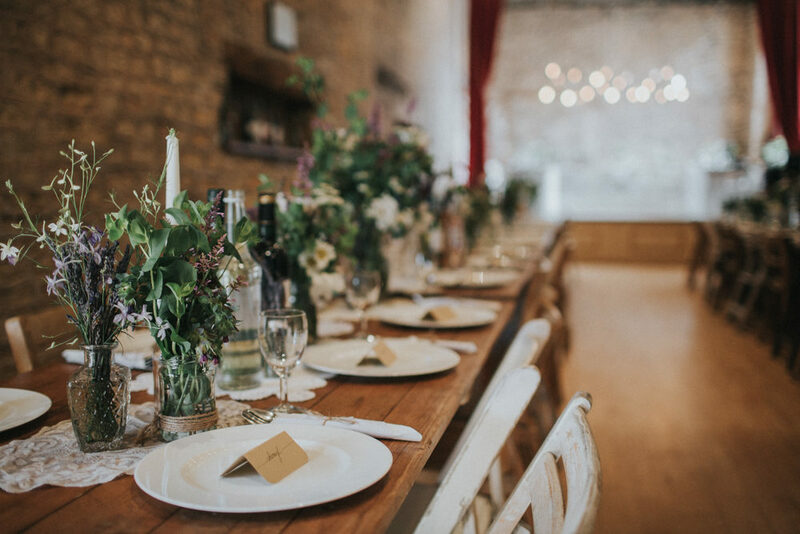 We loved the rustic, countryside feel of the barn, which matched perfectly with our style and theme for the day. For our Christian ceremony it was really important to involve and have the ceremony lead by people close to us. The pastor/minister that had baptised me as a child travelled over from Germany especially to marry us. The sermon/talk was done by a really close friend who also travelled over especially from Germany, he is someone who’s humour and faith we really respect and he has really been apart of our journey as a couple. It was really special to have them both there. The worship music was really important to us too so we had our two favourite musicians from church play and sing at the ceremony in the woodland, this was really down to earth and simple, yet I also found it to be utterly breath-taking. 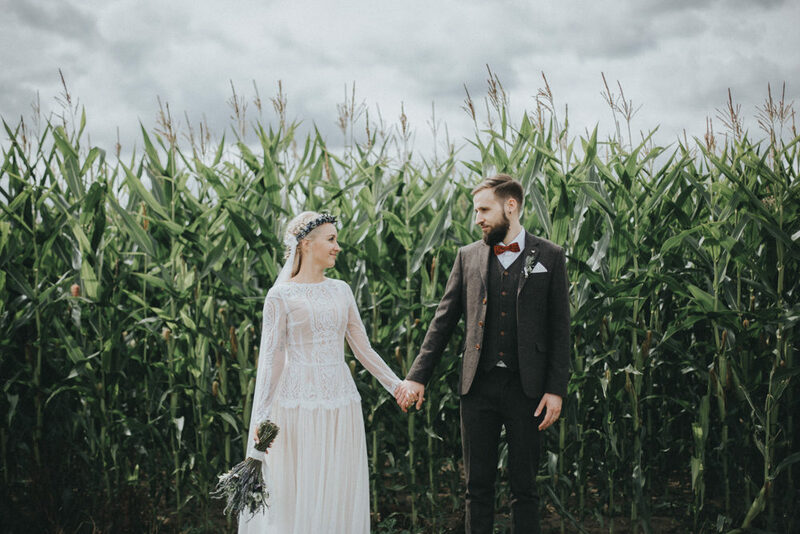 The style of our wedding was overall a relaxed, non traditional (we wanted desperately to avoid the elegant/traditional wedding look), down to earth, village-wedding-feel and folk like party. 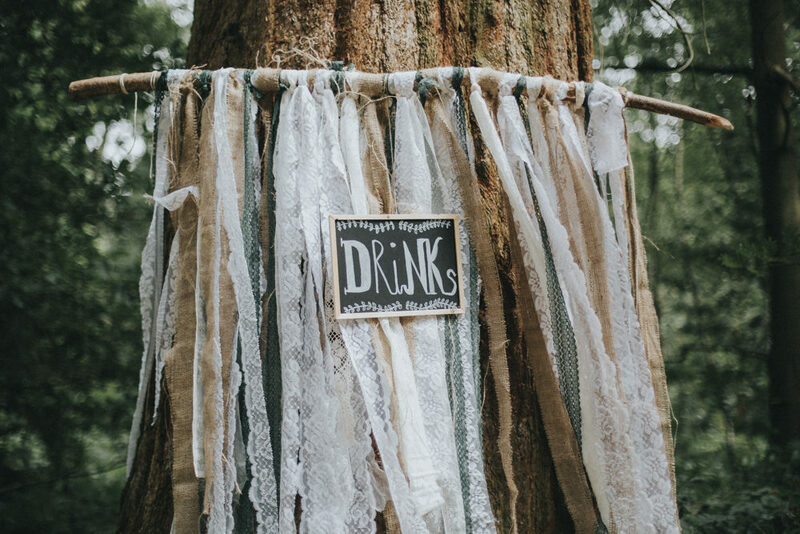 The ceremony theme was very bohemian with dream catchers and hail bails for décor to really reflect our love of nature and the outdoors. 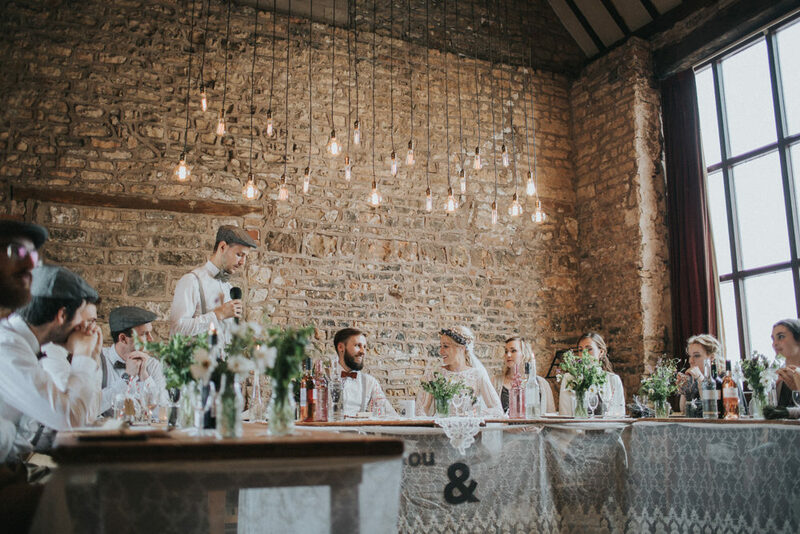 The barn reception then had a more rustic, country feel with tables lined with jars of wild flowers and lace doilies, with a touch of an industrial style, with the bulb lights hanging over our top table. Our wedding was all DIY, we did all the organising and sourcing (except for the tables and chairs which we hired). Our friends and we did everything; it was a real team effort. There was so much thought and love put into it everything, which made the whole thing so personal and unique to us. It was important to us to have a photographer who’s style matched ours. 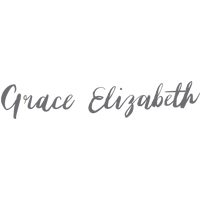 We had seen Grace & Mitch from ‘Grace Elizabeth Photo & Film’ photograph friends of ours weddings and we knew right from the start that we wanted them to photograph and film our wedding day and we were so thrilled when they were able to! 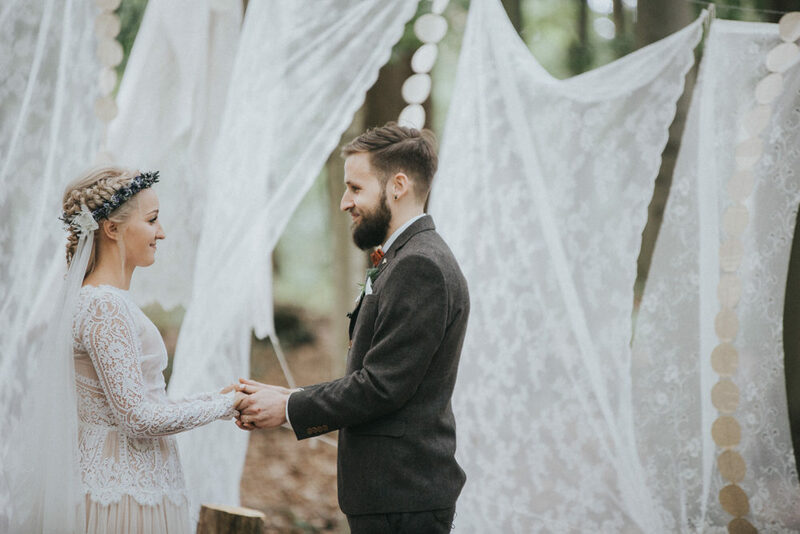 We loved their relaxed, natural and boho style. They really supported and understood us and our style and were amazing on the day and we have since become really good friends. I wore a dress by Katya Katya Shehurina and a bespoke flower crown. 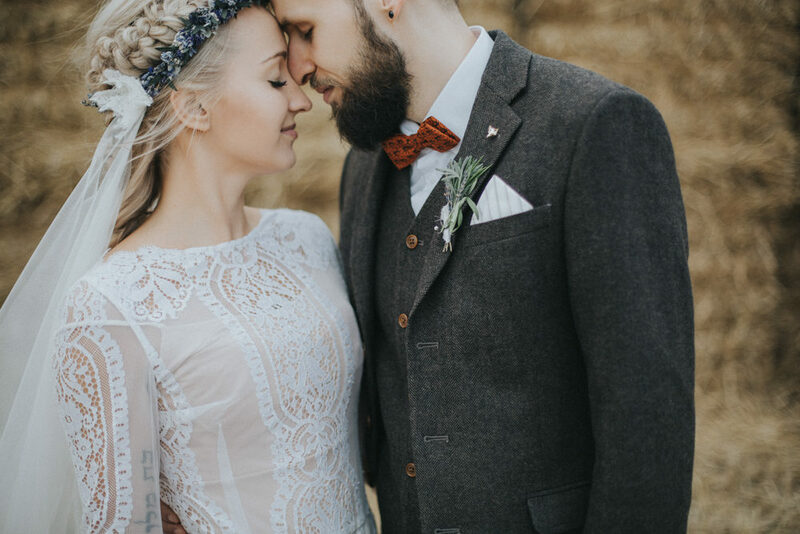 I wanted a dress that would look like it belonged in the polish countryside, to have a Slavic/Eastern European look, as my parents are originally from Poland and I love this style. As I am also a designer it was so important to me that I have a more unusual and creative wedding dress design. Having a dress by Katya Katya Shehurina was for me a dream come true! I absolutely adore her work and have done for years. Going to London to visit her store and trying on and choosing a dress from her collection was probably one of my favourite parts of the whole wedding planning process. As she is Eastern European too, her stunning and unique dresses really matched my desired look. 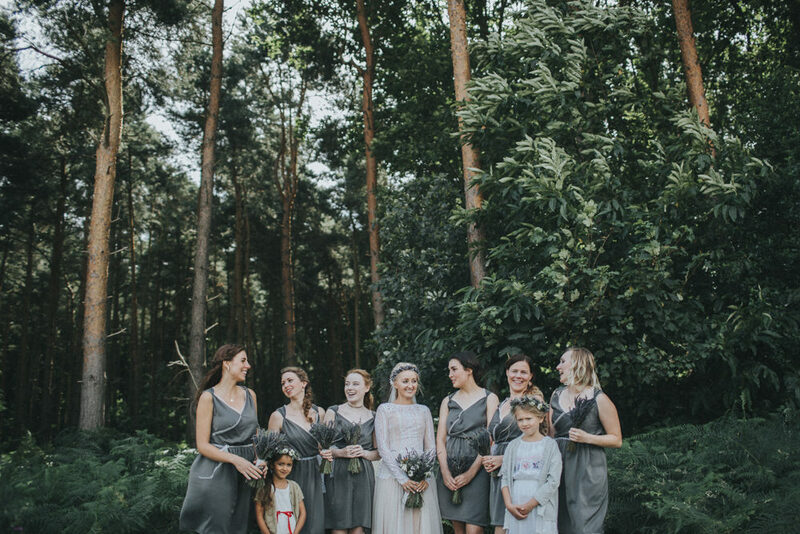 The bridesmaids dresses I made myself, I wanted a relaxed look and a design that really suited everyone one of the girls. 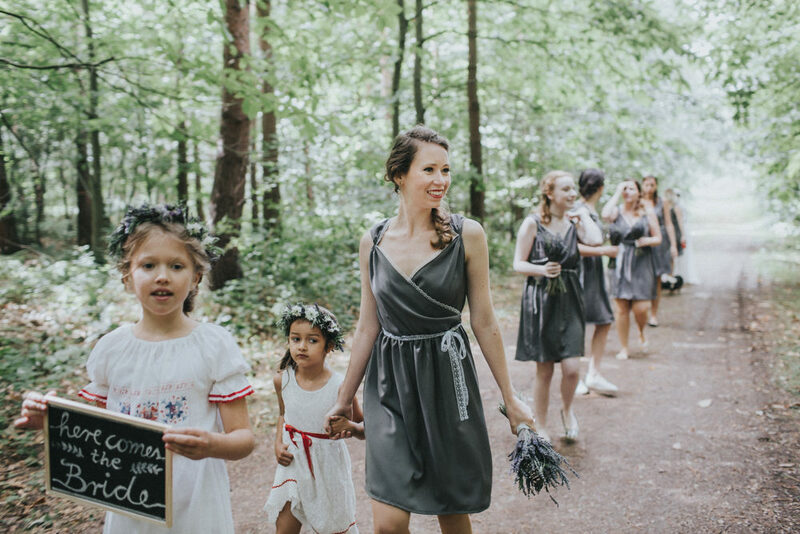 For the flower girls outfits we wanted them to match the Eastern-European look, this was complete with flower crowns by ‘Elder & Wild’ (florist). 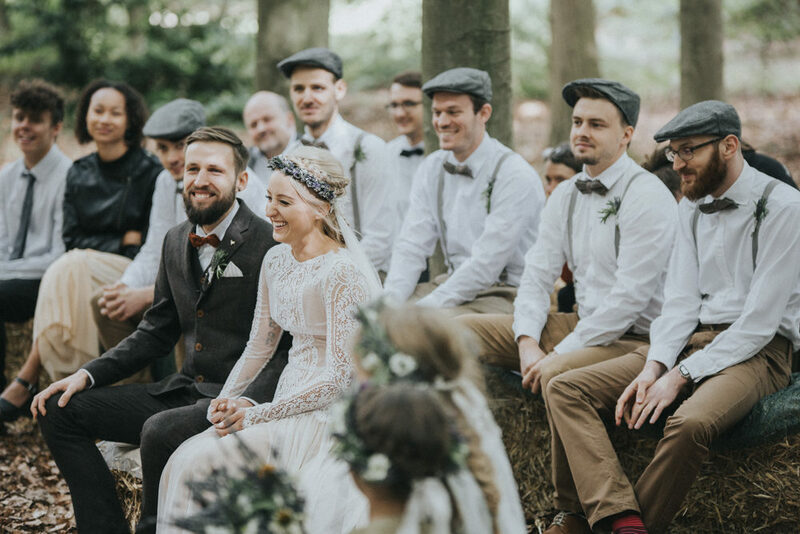 The Groomsmen wore braces, bowties and flat caps as accessories to match our countryside/relaxed/rustic theme, using the colour grey to match with the bridesmaid’s dresses. 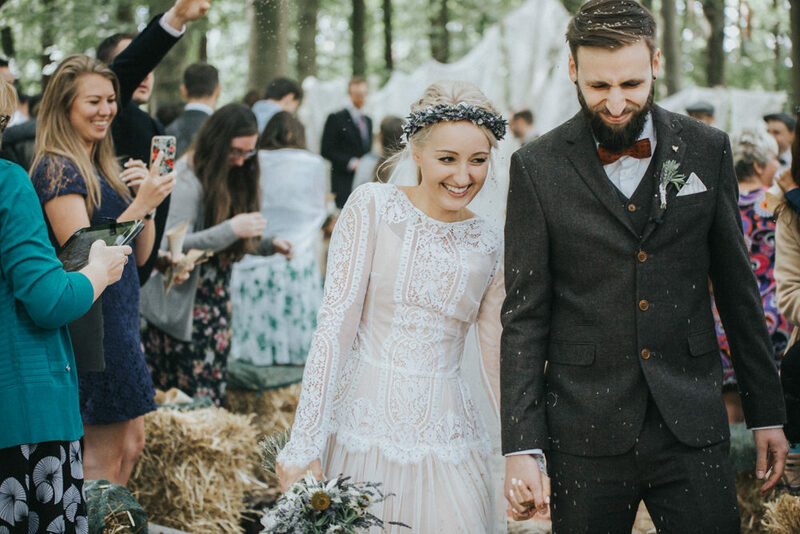 Ruben wanted to go for a brown tweed rustic suit, to find this we looked online for a long time, finally finding the perfect one on ASOS, we then waited for it to go on sale and snapped it up just as the price dropped! The bow tie he wore I had found in a charity shop a few years ago and I had given to him as a gift, so it had a sentimental meaning to us both. 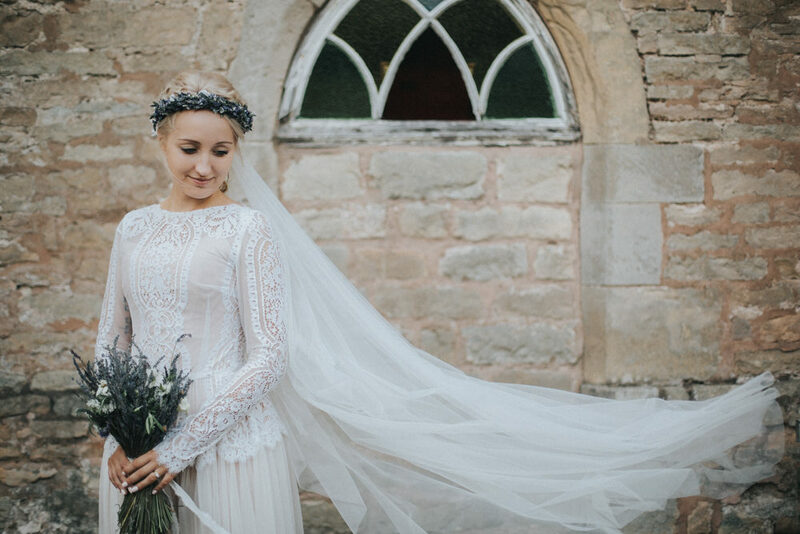 Mitch from Grace Elizabeth Photo & Film did an amazing job – our wedding video is spot on all that we hoped for, it is amazing, I can’t recommend Mitch’s videos enough! We were completely blown away when watching it - I keep watching it over and over again! It was so lovely to have it feature our vowels. 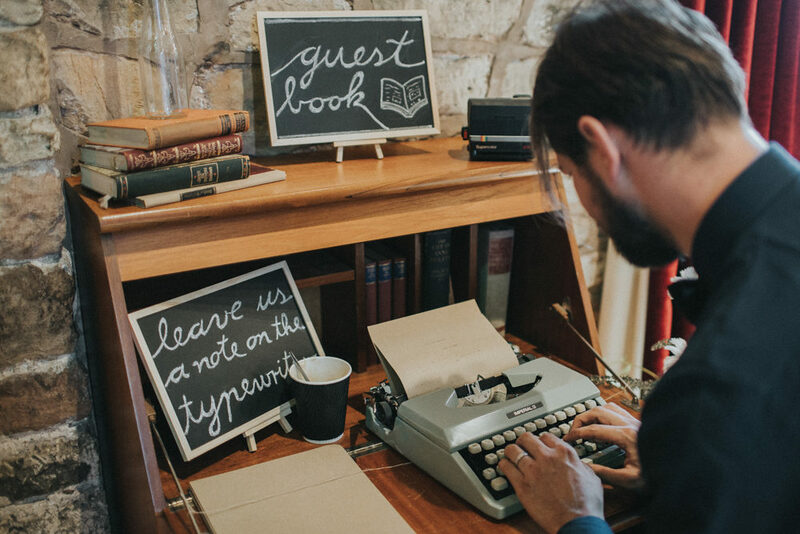 A video really offers a hidden behind-the-scenes perspective of your own wedding; we loved seeing all the expressions and emotions of our guests that we missed on the day. It creates a whole other level of memory and emotion when looking back on our day. For us food was not a big fuss, it was kindly made for us by my friend and colleague from the café I work at and we just had a classic Sunday roast and in the evening we had cheese platters. 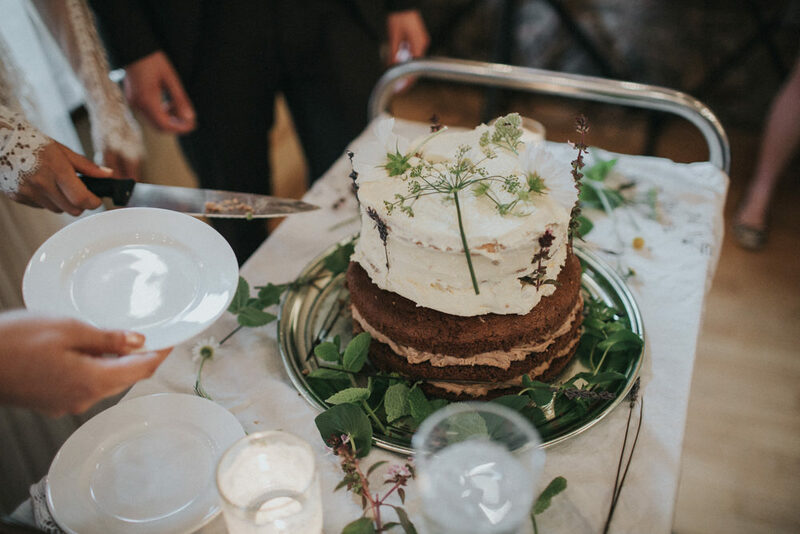 Our wedding cake was homemade by one of my bridesmaid’s Natascha who came over from Germany for the wedding day. A big thing for us was coffee! We are big coffee lovers, in fact Ruben proposed to me in the best coffee/barista shop in Britain – so incorporating this was really important to us. When we found The Split Screen Coffee Co. we knew they would be perfect! Jen was an absolute dream, her coffee was so yummy and she also made us amazing muffins, cupcakes and macaroons! Her and her husband were so supportive and helpful to us, communications with them were great and they were so kind to us, even letting us use their own private car as our wedding car (the VW campervan), which her husband drove us in on the day! Our flowers were almost all home grown by our florist Becky (from Elder & Wild) which made it really special, we love supporting local businesses and a lot of thought and effort was put in to our beautiful flowers. 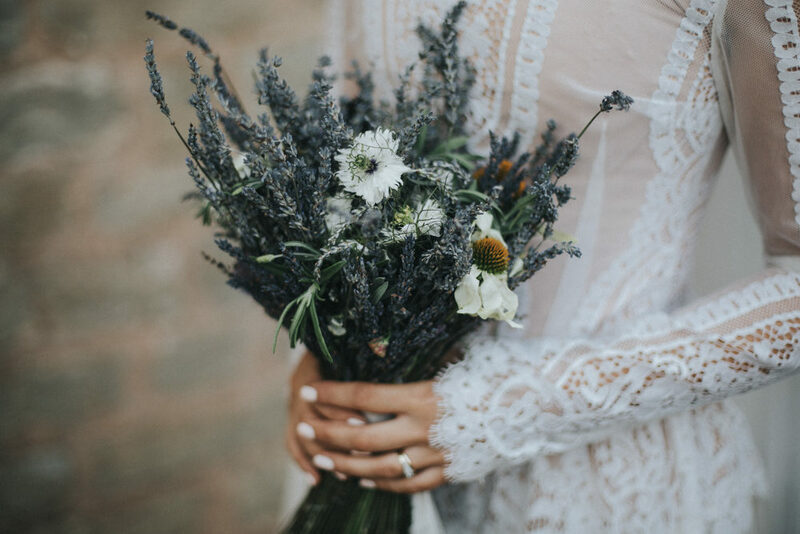 I had a beautiful bouquet of wild flowers, I really wanted lavender, blues and whites used, they also had herbs in which made them smell incredible throughout the day! Becky (Elder & Wild) also made flowers crowns for the flower girls to match the bridesmaid’s bouquets. I also had a flower crown to match from Katie at Lotus Floral Art, she was so helpful and really grasped my vision for the floral crown. In the evening we had a ceilidh dance, this was done by Schuggie from ‘Ceilidhcalling’. He was great and felt like a part of the family, he was so fun to have around and he made the evening and dancing so fun, he added some great Scottish flavour to our evening. We started dancing in the hall and ended up moving into the courtyard, all our guests joined in and had a really great time dancing together – it was such a great atmosphere. Our bridal party organised some games during the evening one of these was a German wedding tradition (as we are both German), the Veil Dance – this is a popular game for a wedding evening. 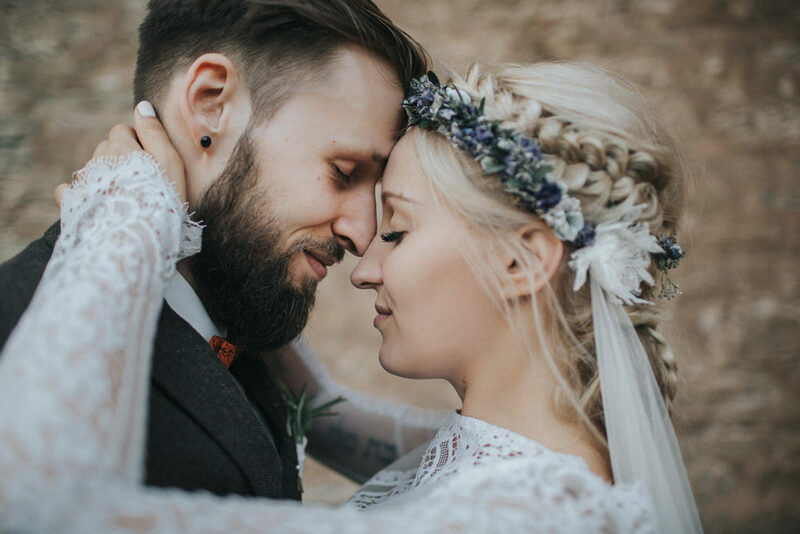 Every woman or man who wants to dance with the groom or bride, has to pay for it and then dances with them under the veil – our bridal party asked people to put money to contribute towards our honeymoon – which was a lovely thoughtful sentiment. Try to time your wedding well, do it at a time when you don’t have lots of other big things going on in life, I ended up having to try balancing it with organising and moving house and doing a degree, all at one time. 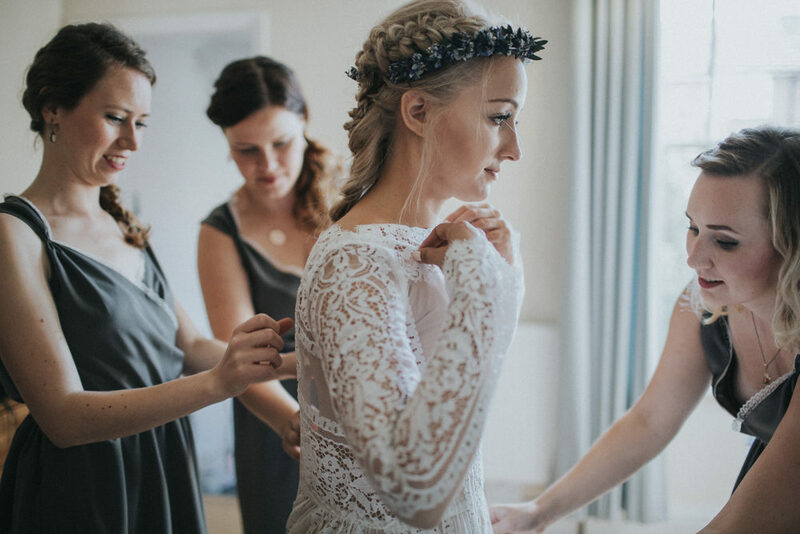 It is easy to want everything done for starting your new life together by the wedding day, but try to be wise and leave things that don’t really need doing beforehand, until after the wedding day. Also don’t over think the little things, sometimes it really doesn’t matter that much in the end. I am a perfectionist, but at times I made myself take a step back and asked myself does it really matter if this bit isn’t 100% perfect? Relax and enjoy the process, don’t put lots of pressure on the small things. 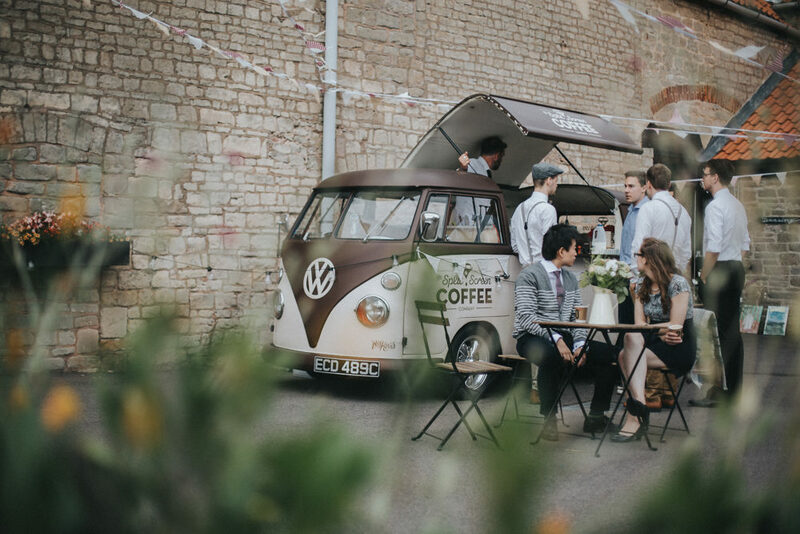 Transport & Coffee Van Split Screen Coffee Co.
Lorna loves a new posh frock, is a hopeless romantic and is lucky enough to be living her 'happily ever after' with her wonderful husband & three beautiful babas. I can’t pick a favorite thing of this wedding. The hanging lights, the beautiful couple!, the grey bridesmaids dresses, the bouquet and florals. I can’t stop scrolling through all this amazing! This is one of the most beautiful dresses I have EVER seen! 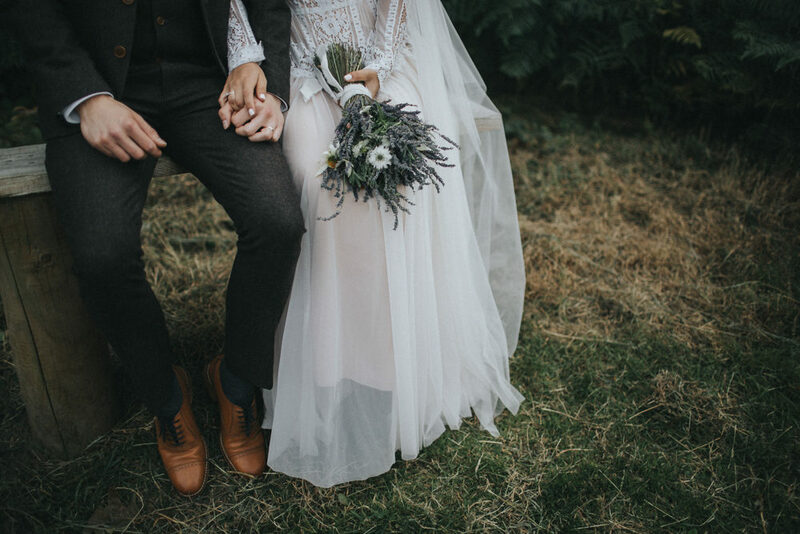 I know a lot of brides would say this, but I’m SURE that if I had this dress, I would simply have to wear it again… and again – even if in the garden. Grace Elizabeth Photo & Film’s photography is divine. I have enjoyed every single photograph here.